The upcoming Draconid meteor shower in October will be impressive, but few people on the ground will get a chance to appreciate its true scope. For a brief spell on Oct. 8, up to 1,000 meteors per hour will streak through Earth's atmosphere, according to a recent study. Unfortunately, the flurry will peak around 1 p.m. or 2 p.m. EDT (1700 or 1800 GMT), meaning the sun will drown it out throughout the Western Hemisphere. The skywatching prospects in Europe are a little better, since the sun will have set in many places when the shower peaks. However, even European skies won't be very dark. The moon will be about 90 percent full on Oct. 8, washing out much of the Draconid meteor shower, said Cooke, who was not affiliated with the recent study. That's barely above the normal "background" rate of shooting stars, and a far cry from counts seen during stronger showers. August's Perseids, for example, typically clock in at about 100 per hour. "You go out in a normal year and look up for the Draconids on October 8, and you're going to be very sadly disappointed," Cooke told SPACE.com. That's not to say the shower hasn't dazzled in the past. Peak meteor counts topped 10,000 per hour in 1933 and 1946, and they ran into the hundreds in 1952, 1985 and 1998. These shed comet particles tend to cluster into "streams" or "trails." If Earth happens to slam into a particularly dense particle stream or two, the meteor shower can be much more spectacular than usual. That's what happened during previous big Draconid years. And it will happen again this October, when Earth will barrel through streams of comet material ejected by Giacobini-Zinner during the 1890s and early 1900s. In the recent study, astronomer Paul Wiegert of the University of Western Ontario calculated that the 2011 Draconids will peak at a rate of about 1,000 per hour. Wiegert presented his results in June at a meeting of the Canadian Astronomical Society in London, Ontario. NASA astronaut Ron Garan took this photograph during the Perseid meteor shower on Aug. 13, 2011 from the International Space Station. "Or you could, if you're like Donald Trump, get a cruise ship in the Mediterranean," Cooke said. But he stressed that anyone making such a trip shouldn't get their hopes up too high. The moon will simply be too bright, drowning out most Draconids, which tend to be faint anyway. For his part, Wiegert advised North Americans to step outside and look up after the sun sets on Oct. 8. While the peak flurry will most likely be over, the entire shower won't be. And skywatchers might just get lucky. "Meteor showers are as difficult to predict as rain showers," Wiegert said in a statement. "The Draconids have surprised us before, and they may do so again. I'd encourage anyone outside on the night of October the 8th to look to the northern skies, just in case." Big meteor storms may excite skywatchers, but they make satellite owners and operators nervous. The little comet bits winging toward Earth, after all, are zipping around — and potentially into — their valuable spacecraft. The International Space Station is heavily armored, Cooke said, so the chances that it will be damaged by this year's Draconids are pretty slim. After careful consideration of the risk, officials decided not to take the station through any evasive maneuvers. "They will be flying in their normal configuration during the outburst," Cooke said. Operators might decide to move other, smaller spacecraft. Evasive movements may include re-orienting satellites to present a more armored side to incoming meteoroids. However, performing such maneuvers is risky in itself. There's always a chance something could go wrong, and the spacecraft could fail to re-orient to its "normal" position. So operators always have to weigh those odds against the odds of a damaging meteoroid strike. "It's up to them to decide which risk is greater," Cooke said. "It's all a risk-balancing game." 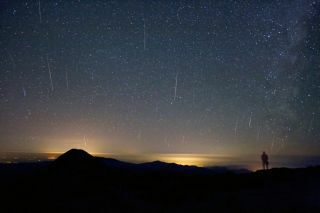 Editor's note: If you snap an amazing photo of the Draconids meteor shower and want to share it with SPACE.com for a story or gallery, contact managing editor Tariq Malik at: tmalik@space.com.